Well this is the first post this month online but August was packed, PACKED with poetry. I am still catching up on some blog posts from June-July and now will be adding August to the pile. Here’s the month in snapshot! Before Perth Poetry Festival I blanked my diary out as much as possible and missed some fine Midlands poetry events. I did a lot of research for Perth Poetry Festival and signed up to an anthology which I was lucky enough to be online for when the thread was posted, a project that is so popular it has a reserve list (more on this later). The main event this week was a Book Launch in Cheltenham for a charity anthology that I was fortunate to have the shortest poem (apart from short form) I have ever written included in it. The event at Hatherley Manor was dreamy and wonderful and the book raises funds for the cat rescue charity New Start Cat Rescue Centre, Huntley, Gloucestershire. I will be creating a full blog post soon (and link back here when I am done). This anthology ‘All a Cat Can Be’ was the brainchild of Sharon Larkin and I am privileged to be involved. It would make a great Christmas gift for any cat lover. Edited by Sharon Larkin and Sheila Macintyre. I also sent a poem to Lucy Dougan for her Monster Field Workshop. 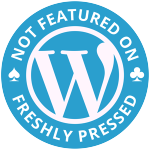 I started working on INKSPILL – annual online writing retreat right here on AWF. More on this soon. Secured this year’s Guest Writers and started research. I worked tirelessly for a fortnight attempting to get the final issue of Contour Poetry Magazine live before flying off to the Southern Hemisphere. I was at this point still waiting for copy, so did what any good editor should do and contacted the poets who had successfully made publication and shelved the remaining editorial until my return. And then I flew to Perth, WA. Where I had an incredible time (lots of posts to follow). It was an amazing festival and I did as much of it as I could! Was mainly jet lag and editing… not a workable combination. I managed to get myself back into Birmingham – it has been too long – over 12 months I think. 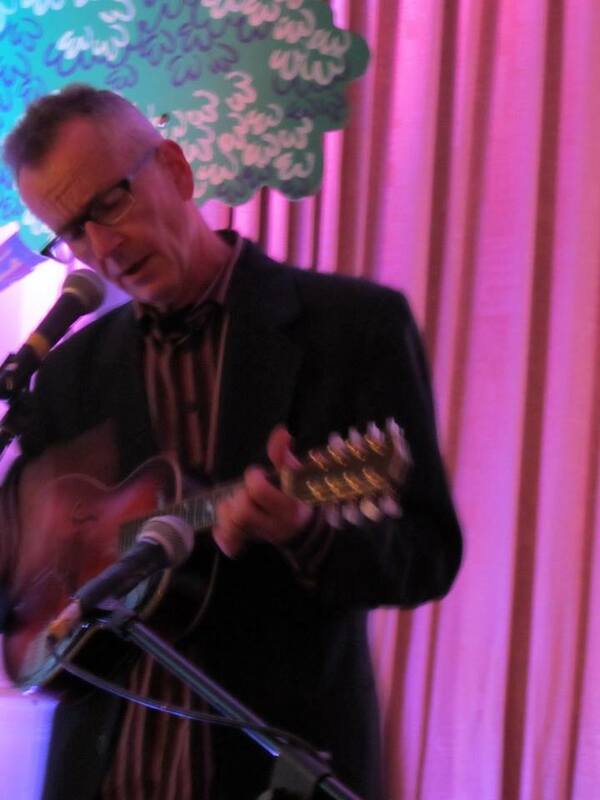 I went to the Big White Shed Brum night and it was packed with poetry – wall to wall and heart through heart. I am going to write the evening up over the weekend if I have a chance but it was a special night. The fusion of East & West (Midlands). There is a cracking poetry scene in Nottingham and this evening was proof of fine work happening in the region. A soft spot for me as I started Spoken Word in the East Midlands in Leicester. And I tie August up nicely with a night at Stanza. I cannot believe the summer holidays are nearly over! Today was the launch of Adam Speaks at Croome Court (National Trust). 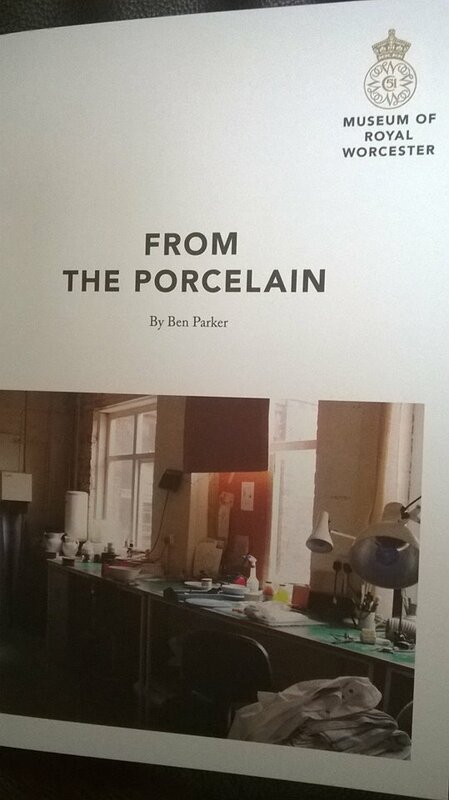 This is a project I have been working on as part of a team from Room 204, Writing West Midlands. The Lead Artist on the project was Chris Alton. I will be writing a full blog post as soon as I can. I had a great afternoon at Croome, it was wonderful to see all parts of the collaboration come together and as for Adam’s Tree House (as it is now known), it was an amazing feat of art and engineering! A beautiful space that the NT team at Croome will be using well, I already have the inside line on a few possibilities. Loved the fact that in the FREE cupcake Marquee there was an ideas board for how to use the art, which will now remain for at least a year. To mark the opening of our new Chris Alton Adam Speaks exhibition we will be holding a launch day on Saturday 25 November with a packed programme of activities. The official opening will take place at 3.30pm by Artist Hew Locke. 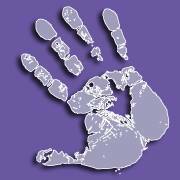 From 12.00pm to 4.00pm, we have a full programme of activities inspired by the Adam Speaks project and its participants. 3.00pm: Formal opening speeches in the Long Gallery. 3.10pm: Birmingham Institute of Theatre Arts performance in the Adam Speaks Tree House. Words for the Birmingham Institute of Theatre Arts and Kimichi School provided and inspired by Writing West Midlands Participants. Adam Speaks themed cupcakes will be available in the marquee on Church Hill throughout the day. (Subject to availability). Our poems were exhibited along with the Adam Speaks display in the participation area downstairs, which isn’t as bad as it sounds, they’re passed by everyone on the way to the Tea Room. They also inspired the dancework of the Birmingham Institute of Theatre Arts and Kimichi School group, which was a delight to know. Every tree has a strong root foundation, no matter how invisible it becomes. Everything starts with a strong base and I for one am delighted that some of that was our ink. It was a great opportunity and one I thoroughly enjoyed and Chris Alton’s Room 204 workshop is going down in history as the longest workshop I have ever taken part in. Time flies when you’re having fun! Immensely proud of my old mobile phone for managing such great shots! I am currently working on an exciting project. Earlier this month Liz Johnson, a composer, contacted me regarding a collaborative project taking place on the 29th September, Elmslie House, Malvern. I felt it was meant to be as I am performing in London (at Free Verse) at the end of the month and originally travel plans meant I would not have been available on the 29th, they changed and I am. You know how I love poetry beyond the page, I eagerly agreed and waited to discover more. It started with Dora Williams (Artist) inviting Liz to three collaborative sessions, at the time they had no idea what the outcome would be. Liz’s award-winning Colwall Requiem for Aleppo became the central focus of the collaboration, with Dora creating new artworks inspired by Liz’s music. Now Liz has responded by composing a new work for solo viola Credo in which music from the Requiem is reworked and added to, inspired by Dora’s series of abstract paintings. The performance will include discussions with Dora, Liz and Adam about the creation of the piece and the whole Creative Synergy project, and there will be opportunities for the audience to ask questions of the performer, composer and artist as part of the evening. The collaborative works of artist Dora Williams and composer Liz Johnson explore themes of migration and displacement, through art, film and music with Credo performed by Adam Römer (viola leader of CBSO) on the opening night. The exhibition opens on Saturday 30th (10 – 4 pm) and runs until the 8th October. 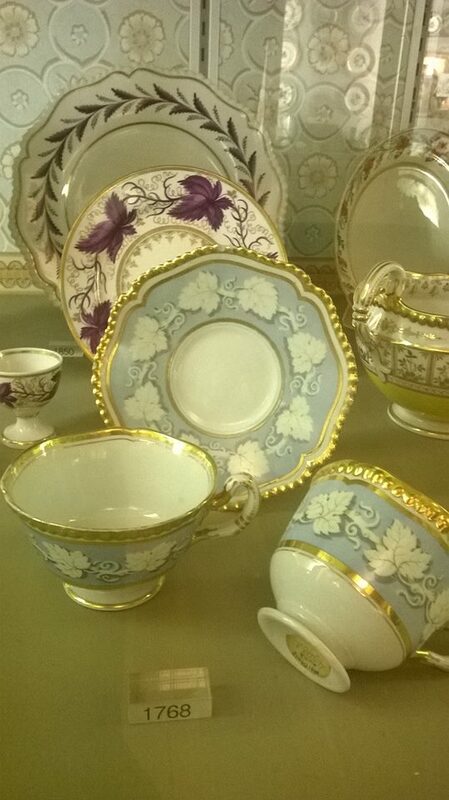 Details (Free admission 2.30-4.30pm). This piece explores what we believe, with music from ‘Colwall Requiem for Aleppo’ inspired by the art work of Dora Williams, the plight of refugees, the Grenfell Tower disaster and what we consider to be ‘Home’. 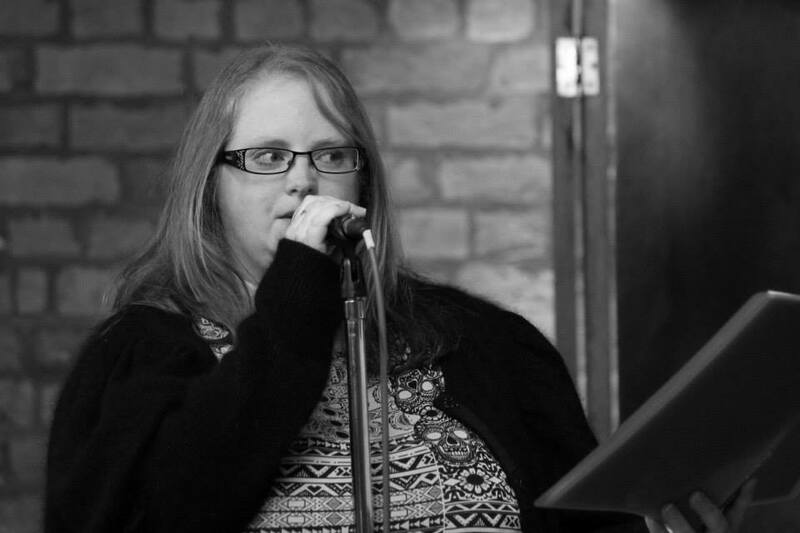 Worcestershire Poet Laureate Nina Lewis will read her own poetry and Liz, Dora and Adam will also discuss the creation of ‘Credo’, which centres around ideas of seeking/finding refuge. Artist Dora Williams has created a stunning new series of abstract works on this theme, on display at the venue. I have spent the past week filled with excitement in anticipation of creating writing for this opening event. I have a busy schedule at the moment and was still working on a WW1 commission (which entailed a lot of research and redrafting), now completed as well as Poetry Workshops when I agreed to this new work. I knew I had to shift my brain for Credo and needed a clear mind. I like head space, the days spent thinking about a project before you dive in – it helps gather thoughts and those which manifest the deepest will stay and become part of the work. The themes of migration and displacement are areas I have written about before. I could use a body of existing work, but felt this was not in keeping with the spirit of the collaborative project. I promised new work and set about creating it. The performance itself is split into three sections, three themes. I have completed writing on two of them. Time wise I have perhaps one or two more poems to write before my set is complete. I asked Liz to send information about the background of the piece, how it has been created and then I used a mixture of audio clips (mainly Requiem music) and images, including an original abstract by Dora Williams. I also used news articles and mirrored some of the instructions given to the musician, writing for the first time improvised poetry. Although, you could argue all poetry is improvised. Intentionally improvised, let’s say. It has been a rewarding process and I am thankful that I managed to find a block of time (in the middle of the night) to complete this work. Some time ago (in secret) I was asked to take part in a performance for National Poetry Day. 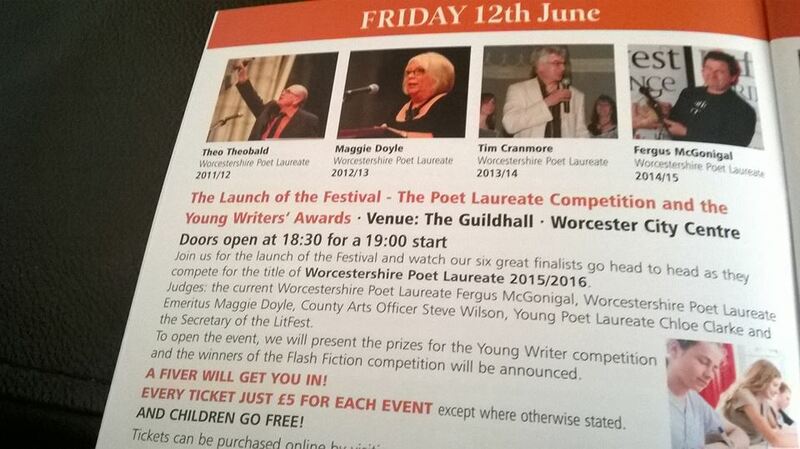 This year’s Poet Laureate for Worcestershire is Heather Wastie and as runner up poets, she invited both myself and Suz Winspear to take part. WLF say that there are opportunities even if you don’t win and I think this is ours. I was delighted to accept. 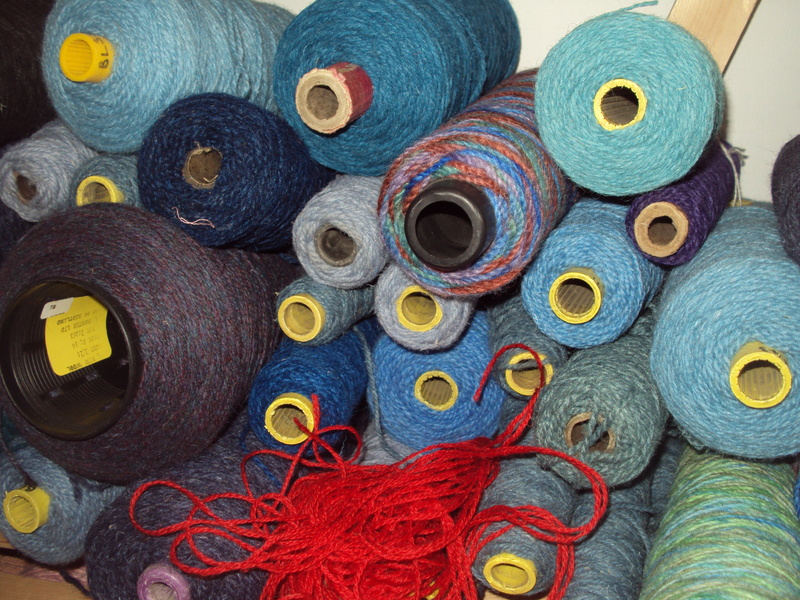 Heather was the Poet in Residence at the Carpet Museum in Kidderminster (traditional trade in the town), an industry, like many that has left empty mills and legacy across the 21st century streets. 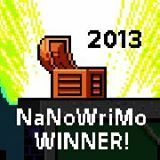 Heather was also one of the three guest writers for last year’s INKSPILL (our very own online writing retreat). 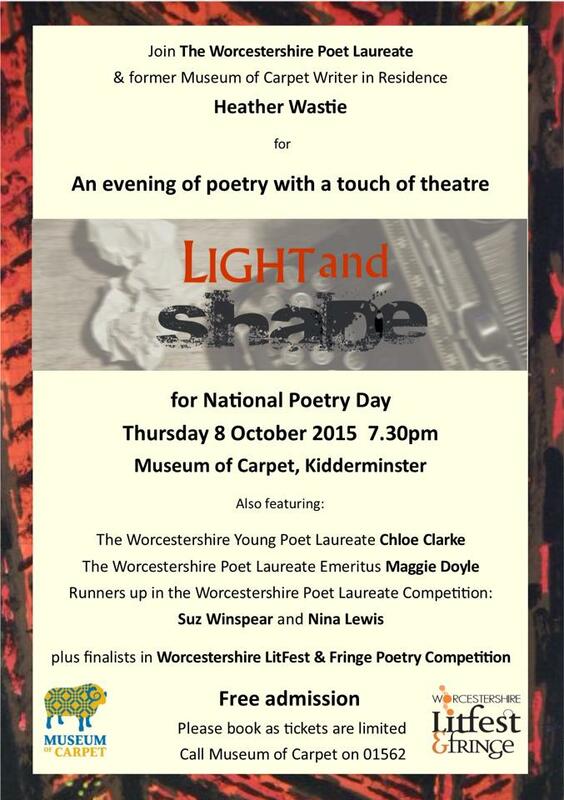 Light and Shade is taking place in the carpet museum in conjunction with Worcester LITFEST. There was a poetry competition (closed 6th September), the 3 winners have been chosen and voting is open for a 4th poet. 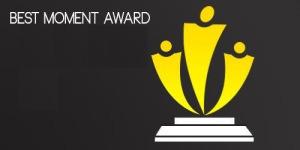 You can vote for free on a one click POLL here. VOTING closes on the 1st October. In preparation for entering this competition there was a special open day at the Carpet Museum, which is an amazing place and so much more than I expected was discovered. It was a relaxing few hours walking around to the gentle hum of poet’s pens scribbling away. I had a whole notebook of ideas. A few weeks later Heather, Suz and I met to explore ideas for the writing and the performance space. I was able to use some of the audio resources to gather story. Heather also shared conversations she had had with weavers as part of her residency, these helped a lot with finding character. Suz and I went away and wrote our poems. We all met again to rehearse the project, it was great fun and I think it is a unique project to be part of. The event is free, the performance space has limited capacity so you will still need to book tickets. I love being busy on NPD (National Poetry Day) and I look forward to being involved in the world of carpet for this one. I have broken up from work for the Easter break and am looking forward to 18 glorious days in my writing skin. There is already a lot of news to share. Firstly, Mouth & Music which was a fabulous night that I am still on a high from, sent exciting news today. Slap Magazine (supporting local arts and performers) want to publish the photo Mary Davis took of Tim and I performing and much as it makes me want to get an instant body wrap, attach myself to a zumba DVD and pray for instant weight loss, I am still stoked with this news. Secondly, I attended my first meeting tonight as an Assistant Writer for WWM Writing West Midlands. It was a buzzing atmosphere and great to be in a room with so many writers, many of whom I have already met; William Gallagher, Stephen, Roz Goddard, Hayley Frances, Ian MacLeod, Brenda-Read Brown, & Garrie Fletcher. My writing diary is packed and my ideas file grew this evening. 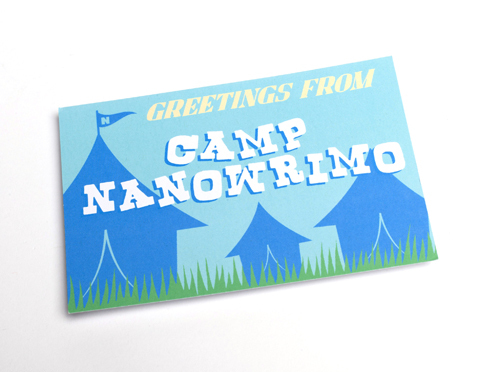 5) Catch up with Camp NaNoWriMo – some major words lost already (non- existent) It is ironic that this year (my 3rd camp) I FINALLY get an active cabin and I am not there to see it. 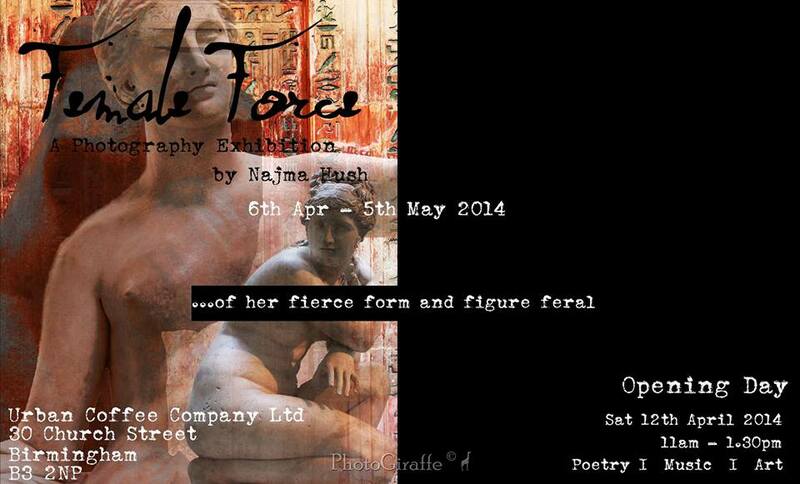 6) Write Strong Women poems and as a result decide whether to do Najma Hush’s exhibition opening. I really want to go to this event but am due in a city more than 45 miles away at lunchtime. I would love to be able to stay until 1:30 when it finishes. I am in two minds, I have mentally checked all possible solutions. Train, buses etc, need to check them properly tomorrow (later on today) but if I do go I will only have an hour there before I have to whizz back for my meeting. 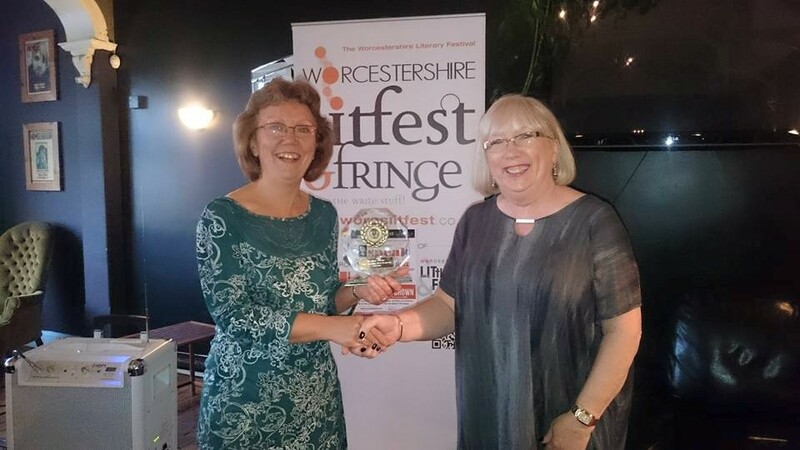 It is the first of three events which see Ledbury Poetry Festival linking up with Worcester Literature Festival (WLF) with performance events at The Hive. 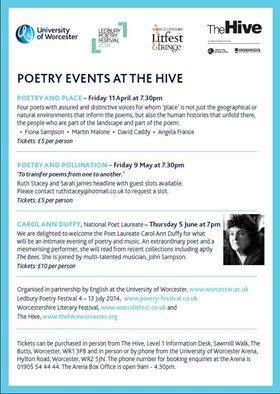 I am involved in performing at Poetry and Pollination in May, organised by Ruth Stacey and headlined by Ruth and Sarah Leavesley (who have both performed at Ledbury in the past) – very much looking forward to this event. Tonight will also give me a chance to catch up with some poetry friends. I have submissions to work on, including poems, on Thursday I have Poetry for Lunch (booked for the next 3), followed by the special ticket holders Hit the Ode and then on Friday I will be performing at The Ort – the first ‘Friday night’ one. 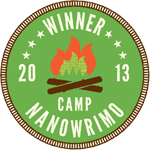 On Saturday I hope to attend a camp Nano meet / write in, followed by a writing group run by Apples & Snakes, Poet’s Place. They started the most recent group meetings in January and I have been unable to attend any yet. 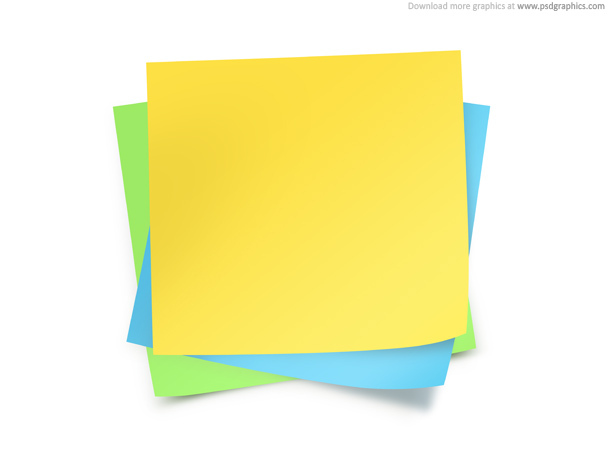 My day of writing is going well – I am using my self disciplined invisible time-table! Today is a National Teacher Strike and my school is closed. 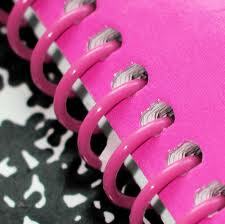 I won’t get paid for supply, I havent had to do any – I welcome this day to write and catch up with my life (as a writer! ), like I mentioned in a social media status – on one hand I don’t make any money today and on the other hand, well the other hand is the one I write with! Mr G made sure I was up early – he forgot I wasn’t working today. After the post event adrenalin of last night – I went to Poetry Bites, an evening of fantastic poetry booked and hosted by Jacqui Rowe (Editor Flarestack Publishing) a group of us went to support Sarah James, who was one of the booked poets, I then found out you could book a floor spot and couldn’t resist sharing a couple of poems. It was a fantastic night and of course when I came home I found myself wide awake to begin with, it was about 1a.m when I rolled into bed, so I could have done with a bit of a lie in and my pink eyes tell that story! I made a coffee, grabbed the 3 issues of my writing magazine that I am still attempting to find time to read and headed back off to bed to do my Admin. 3 hours later, I have emerged (still in PJs) but now online and upright. I had a diary full of writing tasks and now I have an A4 to do list in order and am about to hit the ground running with an edit and final re-write of the poems written especially for tonight’s 3rd Anniversary of Drummonds 42. The theme is Zombies and although I don’t do horror, I have enjoyed attending 42 each month since Halloween and sharing the darker thoughts of my mind which would never be shared in public without events like this. Tonight though – it is special (I feel I should be baking cakes, but I am definitely far too busy writing to do that or clean the kitchen (Mr G)…) in honour of the anniversary I am using the theme and have managed to write 2 post apocalyptic zombie poems… I enjoyed the challenge. My 1st writing task before editing the Zombie poems is to write a short Bio – for the Born Free Anthology – I struggle with these as I never know what to put and can feel my ego smugly pushing me out the way to get to the keyboard. Elaine needs it a.s.a.p so I promised her it would be my 1st online job of the day. Better get some work done now then, the sun is shining – I am happy, have my 2nd coffee of the day – had I been working I would still be without a break and over 3 hours in! Bliss. I cannot wait for the flat sale to go through so I can afford at least a few of these writing days a month. A Great Time Had By All At 42! I accepted the great challenge of writing material which would be suitable for this event – as I am such a scaredy cat that my over active imagination struggles to keep any grasp on reality. 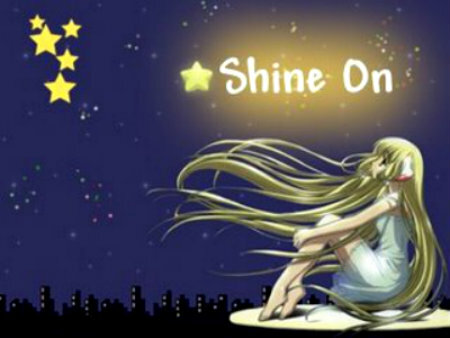 Sometimes I challenge myself to read books from this genre but cannot read them after dark! Anyway I knew I had written some poems this year that would be suitable and I set about writing a few new ones. I know that often poet’s perform the same set or parts of it – I like the fact that signing up to a new event forces me to write new material. 1 month – 5 events in Leamington, Stratford-Upon-Avon, Birmingham and Worcester. And my confidence is high – audiences are so kind and other poets are great at giving feedback. 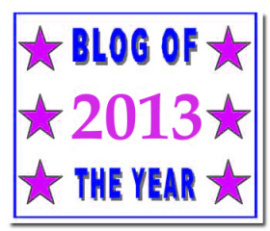 Thanks to Andrew Owens for making me feel so welcome and using my blog tag line in the introduction! I also saw a writer I met back in April at Keith Lindsay’s Writing Workshop. 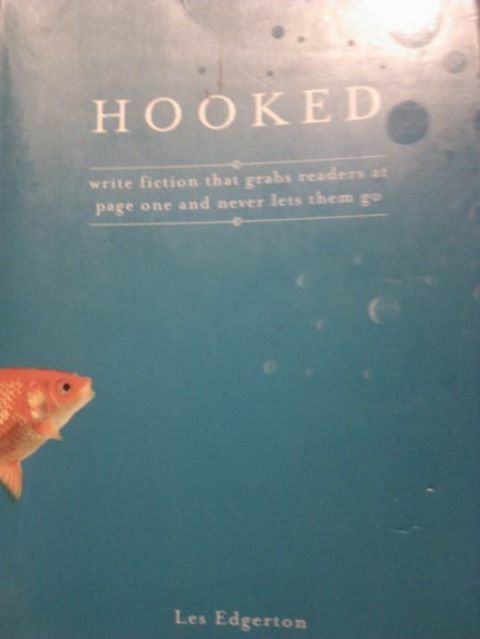 We got talking and he leant me a book – about writing – will help me through NaNoWriMo for sure! So thanks for trusting me with it James. 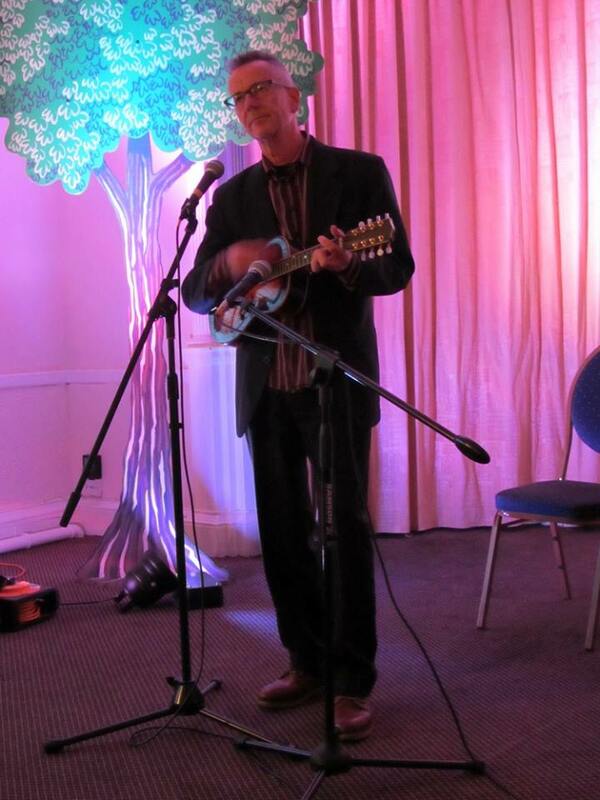 I had a fabulous night, heard a mixture of stories and poems and had some great feedback on my set. and this year we hadn’t made any plans to. The only party/ gig we have been invited to clashes with a gig we have already booked so until a few weeks ago I had no need for a costume. Unpacking my fancy dress wasn’t a priority and it is still buried somewhere in the 3rd bedroom (which we will tackle later this week!) 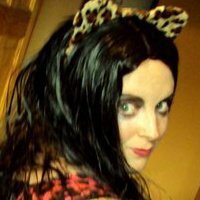 … I did have skulls on my dress…. and at least I didn’t have to worry about my make up running! 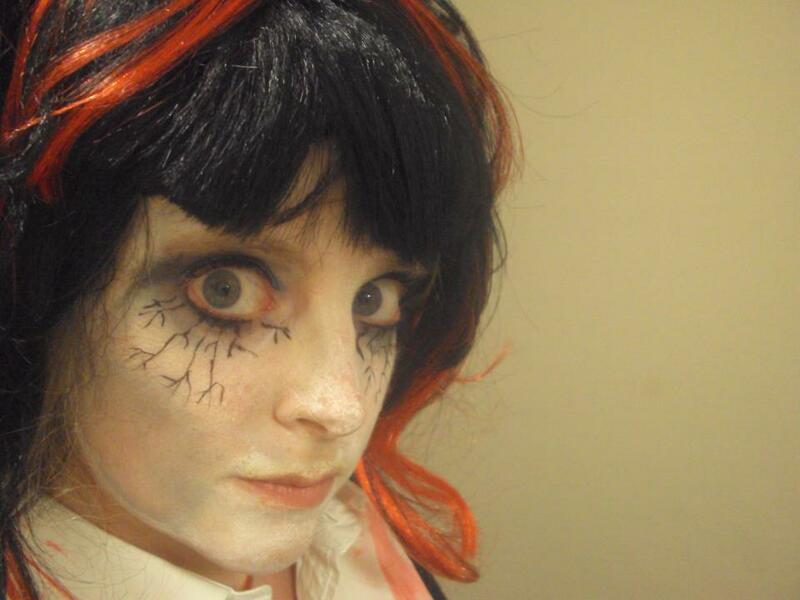 A spoken word event was the perfect way for me to include Halloween into 2013. 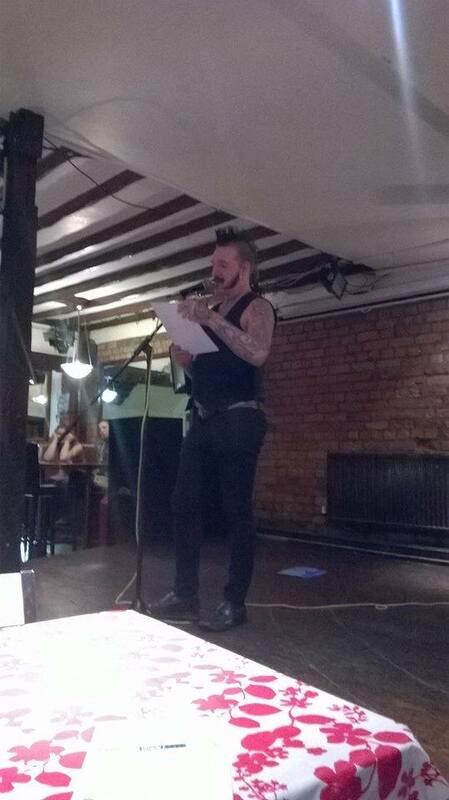 The next one is a Flash Fiction event, so may need to work on some material for a while! For the 2nd time this week I am back behind the mic. Tonight’s Spoken Word is Drummond 42 and it is a spooky spectacular. I don’t tend to write scary stories or poems so I have found finding and writing my set challenging. 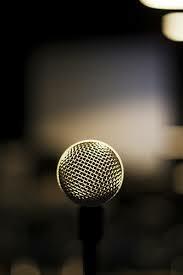 It is great to seek these challenges and new opportunities both as a poet and a performer. The result is I have several poems that would never have been written. I am feeling nervous – I usually post after the event. Fingers crossed it will be as great as all the others! Wednesday the 9th October I was booked for a full day of work on the understanding that I had already booked events at the Literature Festival and had to finish in a timely manner to make my way into the City. Well two reasons I am good at what I do is I am committed and thorough – so I couldn’t leave before I had completed marking and then my car was blocked. Traffic into the city was mad and although I found parking- prayers answered… I was half an hour late! Which meant I missed Neil Astley’s introduction, gutted – especially after meeting Simon Thirsk at the network event in Oswestry, back in September. Ironically I was booked the next day for more work at the same place & could have caught up with paperwork then! 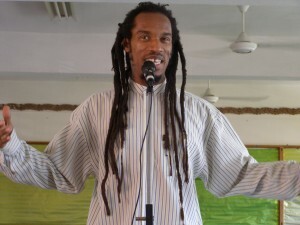 The film made by about Benjamin Zephianiah was great. I use his poetry a lot in schools and when I was a performance poet on the Leicester circuit I met a good friend of his Oscar, who also wrote great poetry and made amazing Carribean dishes! I wanted to see this film and am a bit gutted I missed the first hour, the seats were uncomfortable and plastic and I doubt I could have managed the whole 2 hours after a full days work! It was inspiring and poignant and insightful. A very enjoyable show to watch.